I had a little foray back to my childhood this morning when I was in the garden. I was cutting up some dead branches when I spotted this insect (?) cocoon made from tiny little sticks, stuck to a branch. It looked like the occupant was long gone. I haven’t seen one of these for many years — probably since I was a kid. I have no idea what sort of beastie lives in this sort of cocoon, but I’ve always been fascinated by the amount of time and effort that the animal spent making it. Anyone know what lives in one of these? We have a thing like that here (Maryland, USA) that only attacks juniper bushes. 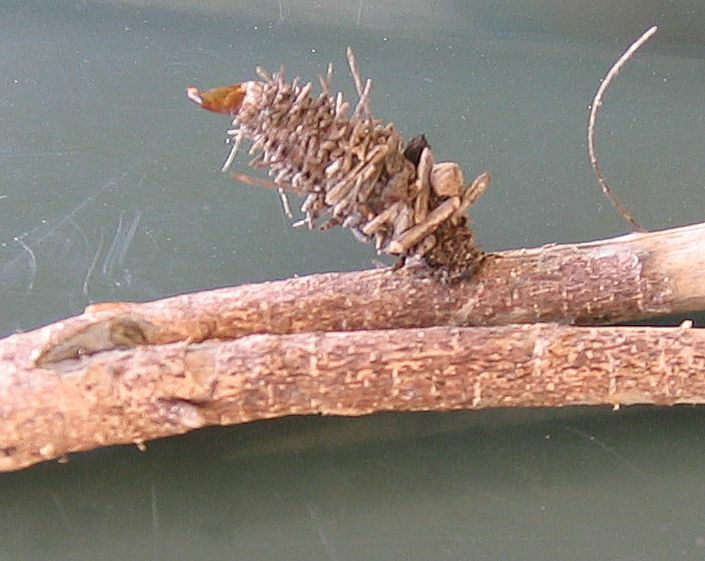 It’s a caterpillar that wraps itself up in the dead juniper needles. I think it’s locally known just as “webworm”. I’m not sure what it’s scientific name is.